In 1974, the USDA declared July as National Blueberry month. In the 1990’s health researchers began to explore the antioxidant activity in Blueberries. In 2010 Blueberries became “little blue dynamos” and are considered a “superfood” since they’re full of antioxidants and phyto-flavinoids, both protect body from stress and cell damage. 2. Blueberries are the King of Antioxidant Foods ~ Antioxidants help our cells fight stress by neutralizing other environmental damaging effects that cause damage to our cells by 20%. Blueberries are believed to contain the highest antioxidant capacity of ALL commonly consumed fruits and vegetables. 3. Blueberries Reduce DNA Damage ~ which may help protect against aging and cancer. Oxidative DNA damage (like rusting metal) is part of everyday life and is the reason for the aging process. It is said to occur tens of thousands of times per day, in every single cell in the body. 4. Blueberries Protect Cholesterol in The Blood From Becoming Damaged ~ Oxidative damage is not limited to our cells and DNA. It is also problematic when our circulating LDL lipoproteins (the “bad” cholesterol) are oxidized. 5. Blueberries May Lower Blood Pressure ~ Blueberries appear to have significant benefits to 8% reduction in the risk for developing high blood pressure (hypertension). The anthocyanins (blue, violet, red pigments) in Blueberries help open blood vessels, which allows for smoother blood flow and a lower risk for high blood pressure. 6. Blueberries May Help Prevent Heart Disease ~ In a 2013 study on 93,600 nurses, eating plenty of blue, violet, red pigments linked to a 32% lower risk of heart attacks. 8. Blueberries Can Have Anti-Diabetic Effects ~ Research suggests that these blue, violet, red pigments in blueberries can have beneficial effects on insulin sensitivity and glucose metabolism. In a study of 32 obese subjects with insulin resistance, a blueberry smoothie caused major improvements in insulin sensitivity (Diabetic). Improved insulin sensitivity should lower the risk of metabolic syndrome and type 2 diabetes, which are currently some of the world’s biggest health problems. 9. Blueberries May Help Fight Urinary Tract Infections ~ Urinary tract infections are a common problem in women. It is well known that cranberry juice can help prevent these types of infections. Blueberries are highly related to cranberries, and contain many of the same active substances as cranberry juice (UTI). These substances are called anti-adhesives, and help prevent bacteria like E. colifrom binding to the wall of the bladder. 10. Blueberries May Help Reduce Muscle Damage After Strenuous Exercise ~ Strenuous exercise can lead to muscle soreness and fatigue, in part, by local inflammation and oxidative stress in the muscle tissue (Muscle). Blueberry supplementation may reduce the damage that occurs at the molecular level, minimizing soreness and reduction in muscle performance. In a small study of 10 female athletes, blueberries accelerated muscle recovery after strenuous leg exercises (Recovery). Here is a link to a yummy smoothie recipe. 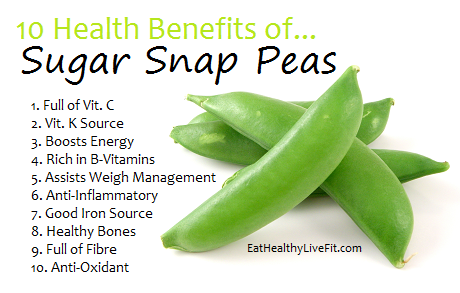 Peas are really little powerhouses of nutrition that are a great for your health. Peas are low-fat but high everything else. A cup of peas has less than 100 calories but lots of protein, fiber and micro- nutrients. Peas contain high amounts of a protective nutrient that works to prevent stomach cancer. You only need 2 milligrams per day of this phyto-nutrient (plant nutrient) to prevent stomach cancer. A cup of peas has at least 10. Peas contain high levels of anti-oxidant. heart disease, cancer, and aging in general. • Omega-3 fat in the form of alpha-linolenic acid (ALA). High fiber and protein slows down and regulates the pace of how fast sugars are digested. All carbohydrates are natural sugars and starches with no white sugars or chemicals to worry about. of plaque along our blood vessel walls starts with chronic, excessive oxidative stress and inflammation. The generous amounts of vitamin B1 and folate, B2, B3, and B6 reduce the risk factor for heart disease. create more organic fertilizer for the soil. many areas not needing irrigation or using up valuable water supplies. The high fiber content in peas improves bowel health and peristalsis. vitamins also help to prevent osteoporosis. which results in less bad cholesterol, increased HDL (“good”) cholesterol, and lowered triglycerides.